Here are some suggestions for questions for solution-focused coaches or therapists to help clients improve their interactions with others. I present the questions in the form of matrix. This matrix is based on 'the interaction matrix' which is described in the Walter and Peller, 1992. Only, I have changed both the structure and the content quite a bit. 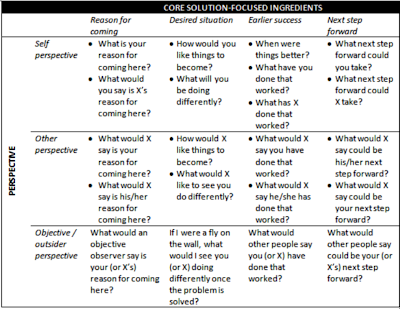 Along the top of the matrix are four essential ingredients of the solution-focused process: 1) reason for coming, 2) earlier success, 3) desired situation, and 4) next step forward. Along the left side of the matrix are the different reporting perspectives: 1) self perspective, 2) other perspective, 3) objective perspective. The power of this matrix is that it generates an abundance of useful question from which to choose. 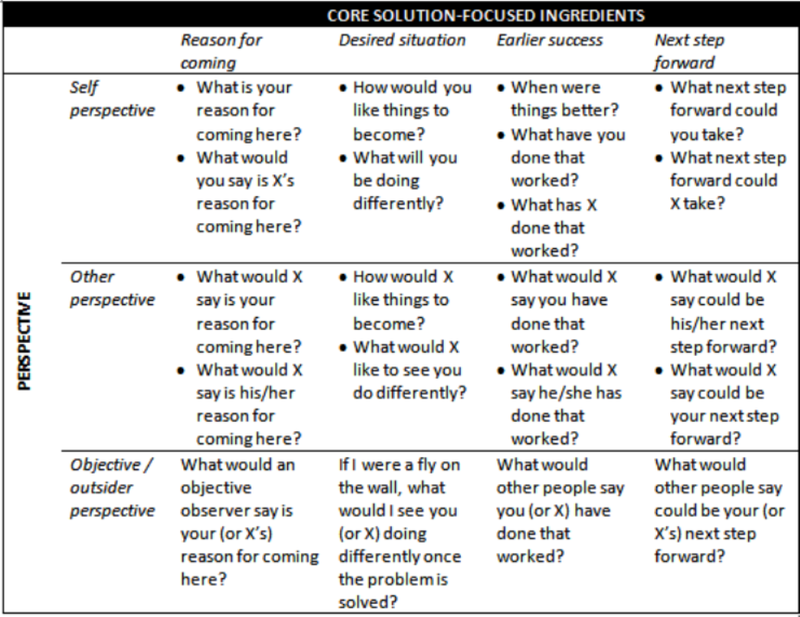 The different solution-focused ingredients help to create a sense of purpose and direction, help identify some ideas for solutions, and help choose which next step to take. Focusing on these ingredients from the three different perspectives is particularly powerful because it helps to see the situation in a different light which often leads to more understanding for the other's perspective. Also, it often leads to more ideas for possible solutions. Here is the matrix (click to enlarge). This pragmatic tool is a great application Plus it allow solutions focused to be seen as a great theory. I have printed this off and plan on referring to it.